Beach-bound toes in the Bahamas. Icaro’s smooth, warm tail felt like slick, wet rubber, and his smile was contagious. I was living out a lifelong dream of swimming with a dolphin, but my 6-year-old daughter wasn’t quite convinced. When she balked at stroking Icaro’s smooth skin, trainer Dominic Rahming knelt to her height and coaxed her gently toward the creature. It took Rahming only a few seconds to draw her into the moment and ease her trepidation. Then he invited us behind the scenes to learn more about the dolphins’ home. 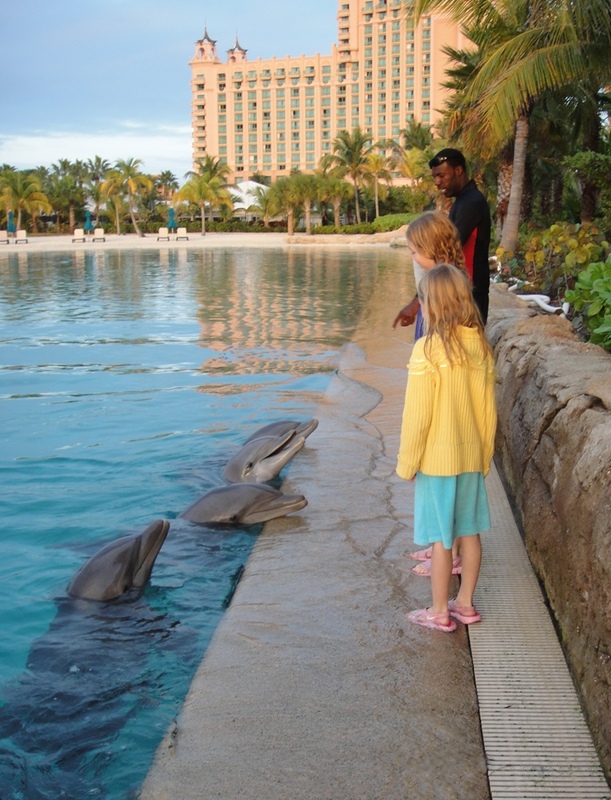 Trainer Dominic Rahming invites Atlantis dolphins to say good bye to two visitors who have been swimming with them in their safe lagoon. Sunset glowed warmly on the coral-colored walls of Atlantis as we walked with Rahming around Dolphin Cay, but soon we were shivering when he led us out of the tropical evening and into a refrigerated room where 600 pounds of fish are thawed daily to feed the dolphins. He also taught us that they require additional drinks of water and demonstrated how an instrument that looks like a modified grease gun is used to quench each animal’s thirst. Back outside, he showed us canvas slings in custom crates that are used to transport the dolphins safely and protect them in case of future hurricanes. 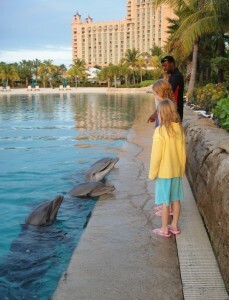 Guests at Paradise Island’s Atlantis can also swim with sea lions and become trainers of either mammal for a day. Near the sea lion pools, we peeked into a cage to meet the resident mascot macaw, Foots. Not to be outdone, the sea lions waddled toward us and reached their noses forward with a hoarse bark as if to say hello. Dolphin Cay is not the only place where Atlantis visitors can take a dip with the more than 250 species of sea creatures in the world’s largest open-air marine habitat. Guests can don wet suits and swim with giant manta rays and thousands of other tropical fish among ruins that recall Plato’s mythical lost city in the Ruins Lagoon. 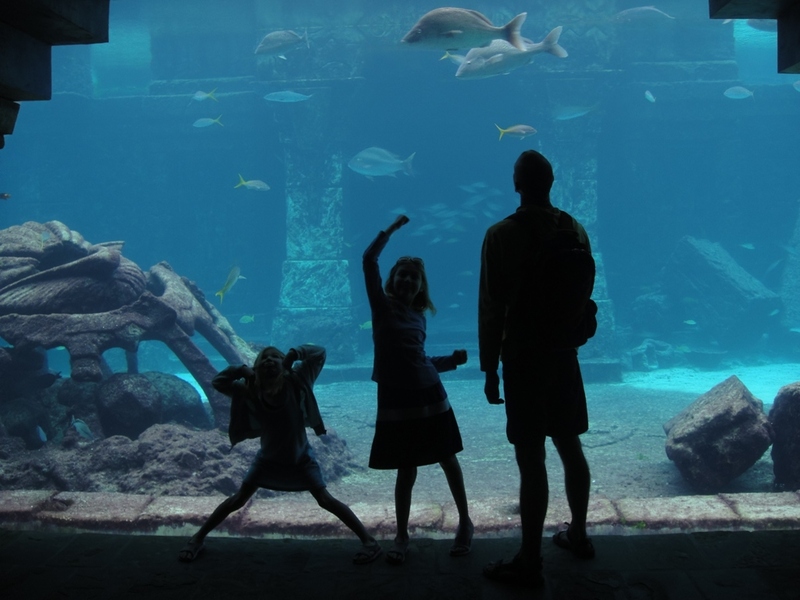 Water is central to the mythical theme of Atlantis, where the world's largest open-air aquarium is home to more than 50,000 sea creatures visible from underwater windows, reef-spanning bridges and lagoon-view restaurants. This part of the resort’s aquarium is visible from its grand lobby, the Great Hall of Waters, through 5-inch-thick windows. Because glass can cause distortion in aquarium views and make fish seem larger than they really are, Atlantis’ creators decided to use acrylic, which provides an accurate view of the piranha, giant grouper, parrot fish, jelly fish and other resident sea creatures. The story of the lost city continues in The Dig, a subterranean labyrinth that is home to abandoned Antlean underwater equipment and hieroglyphs from the mythical 11,000-year-old civilization. Here we splayed our hands against giant windows just inches from cruising sharks and imagined ourselves submerged in the bright blue water that reflected off the walls around us. Oversized acrylic windows provide a glimpse into the world's largest open-air aquarium at Atlantis, where more than 250 species of fish mingle with statues and ruins of Plato's mythical lost city. Christiane Chertilus guided us through the darkened maze and pointed out the yellow mucus that covers moray eels and makes them appear an eerie shade of green. She also taught us how to tell the difference between male and female spiny lobsters by the position of their tails as we peered up at them through a tunnel of acrylic. My daughters were eager to dive into the 20 million gallons of fresh and saltwater that flow through and around the carefully landscaped ruins of Atlantis. With lifeguards assigned to every 6 feet of the 140-acre Aquaventure water park, I was comfortable curling up in the sun with my book and a tropical punch while they delighted in every slide, river and pool. The dripping girls returned to boast of whooshing down a speedy slide and through a shark reef in a clear tube. They had also endured waterfalls and rapids on The Current, a river they had braved on a double inner tube. Our underwater experience took a different twist when my daughters learned from enthusiastic culinary staff at the kids-only Atlantis Kids Adventures club how to make their own tropical reef. They poured dark and white chocolate over buckets of ice and sheets of bubble wrap to produce textured, coral-like pieces. A few sprays of bright color and tasty sparkles sprinkled on top completed the edible treats reminiscent of real Bahamian reefs. In other rooms, they had danced, played house and built extensive LEGO reefs. The best surprise, though, was the kid-perfect bathroom that had individually themed stalls and talking mirrors. 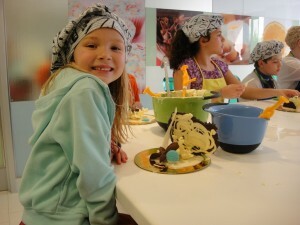 The Atlantis Kids Adventures kitchen encourages individuality, teaches technique and inspires creativity as children build tropical reefs out of chocolate while their parents enjoy adult acitvities at Atlantis. The restaurants we visited recalled the beauty of the tropics with patterned décor, vibrant fruit garnishes, and fresh produce and seafood options. Our cleverly designed dessert sushi was made entirely of chocolate, sweet rice, glazed strawberries and marzipan. Even the chopsticks and tiny plates were edible treats. After full days of swimming and exploring, our evenings were spent in creative endeavors. At Atlantis Pals, we stuffed cuddly animals to take home, and at the resort’s speedway we built and raced remote controlled cars. One evening we donned smocks to paint pottery souvenirs. I dipped my paintbrush in the greens and browns of the local palm trees, but the many shades of blue that my daughter chose for the shells on her candleholder most vividly captured the undersea feel of our Atlantean adventure. 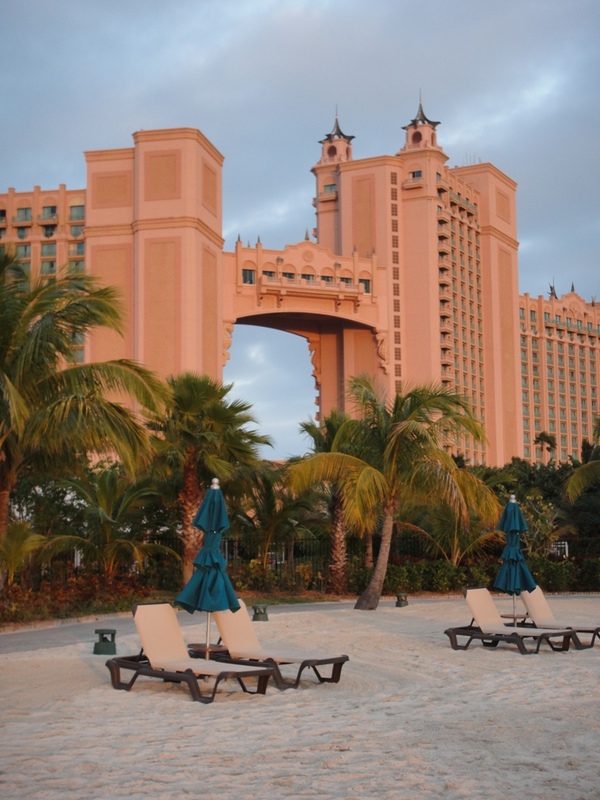 When the sun sets on Atlantis, age-appropriate night life is available for everyone in the family. 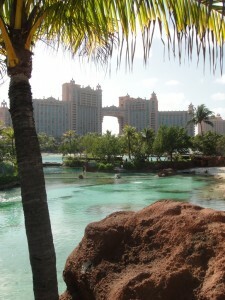 To book online: www.atlantis.com. 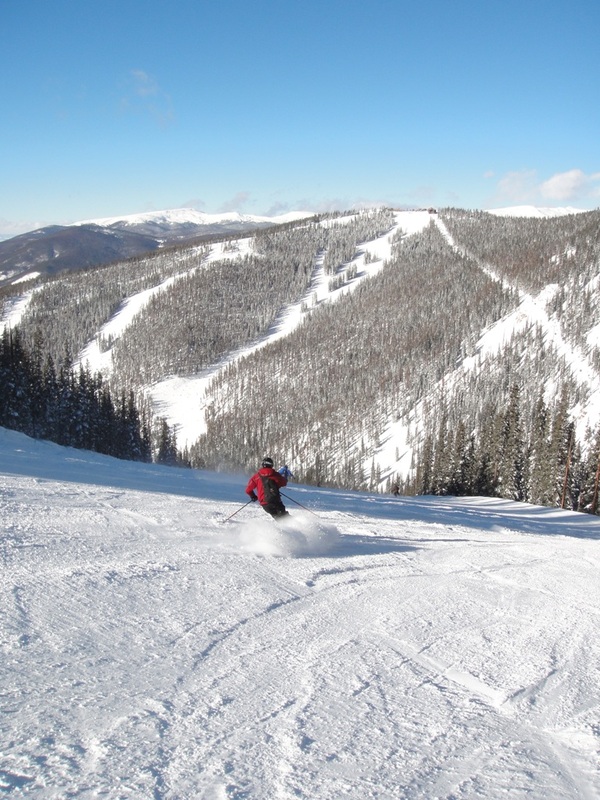 Look for specials available throughout the year. Getting there: JetBlue offers easy connections through New York. On the Island: The trip from Nassau International Airport to Atlantis is 21 miles and easily navigated by taxi. 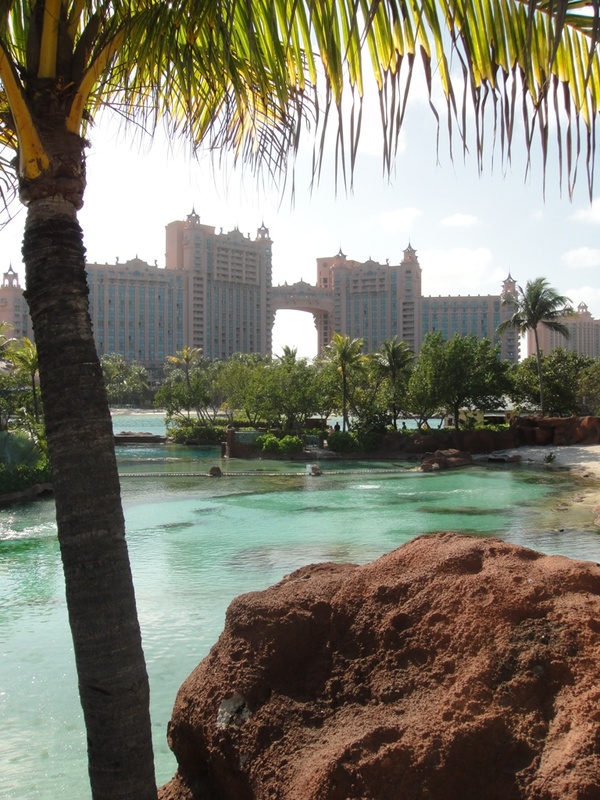 To plan for Atlantis: Water park, library and movies are complimentary at Atlantis, but other activities, programs and dining come with an additional charge. 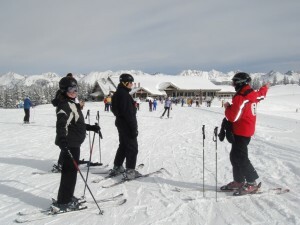 Half-day, whole-day and evening AKA programs are available to fit the needs of young travelers. the casino or adult night clubs. To slip away for a day in Nassau: Find a taxi driver to give you a tour of the island. They are proud of their country and happy to share the rich history of the islands with the tourists who make up most of their national income. Locals recommend dining at The Fish Fry, www.fishfrynassau.com. Souvenirs are available at the world-famous Straw Market , www.bahamasgo.com/treasures/strawmarket.htm. species of fish mingle with statues and ruins of Plato’s mythical lost city. 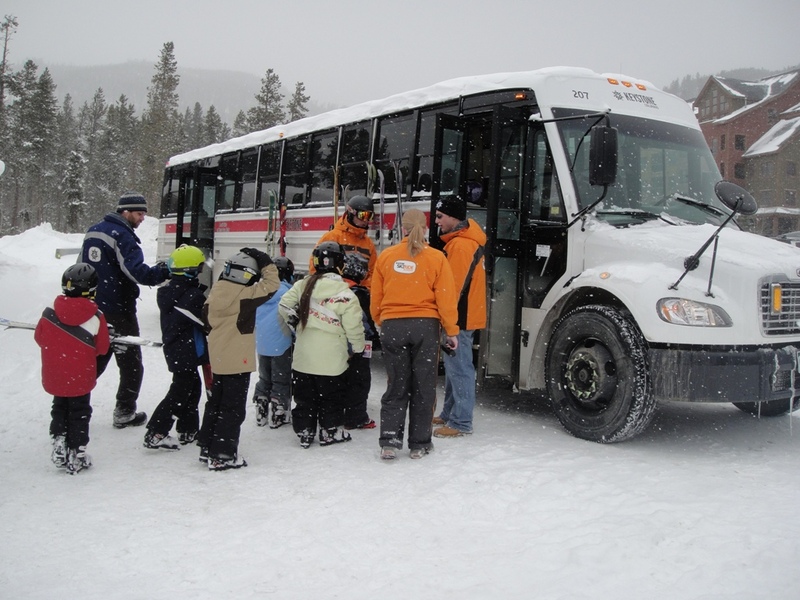 age-appropriate night life is available for everyone in the family. Packing up to take a bite out of the Big Apple. New York’s cosmopolitan and chic reputation make it an attractive destination for martini clinking businesspeople, but the Big Apple can be equally enticing for a family vacation. 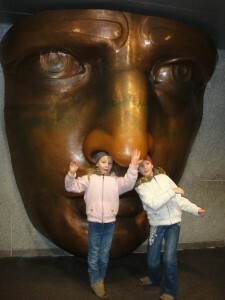 By laying a pre-trip groundwork with my daughters, I was able to kindle their enthusiasm for exploring Manhattan. In “Journey Around New York From A to Z” by Martha and Heather Zschock, a cartoon pigeon alphabetically introduces Radio City Music Hall’s Rocketts and the Zodiac above Grand Central Station among other famous sights. “Miffy Loves New York,” “Action Jackson” and “Eloise” are also exciting to read and helpful in deciding what to see and do in the city. Art Memo, a matching game of famous paintings inspired my family to put the Met and MoMA on our list, and a few tunes by John Lennon got us in the mood to “Imagine” “Strawberry Fields” in Central Park. Upon arrival at John F. Kennedy airport, my daughters were thrilled to hail a taxi like those about which they had read. As we motored to our hotel in Times Square, the city’s neon lights reflected in their bedazzled eyes. “It didn’t look this huge in the book!” my older daughter exclaimed. A view of Manhattan from the Top of the Rock was a good way to start our visit. We were able to get a feeling for the vastness of the city and a mental image of how it is situated. From the top of Rockefeller Center, we found the neighborhood of a new friend from our flight. 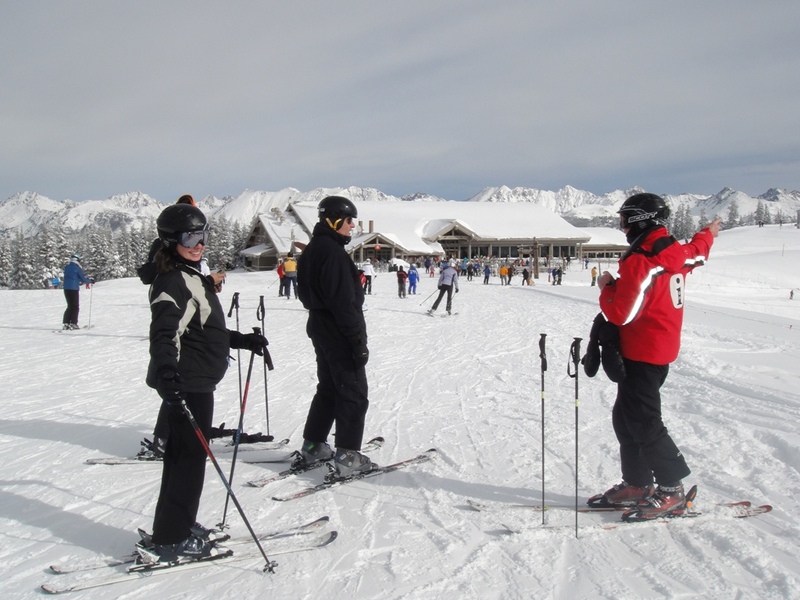 His apartment life with public transportation to neighborhood parks was an exciting antithesis to my daughters’ rambling Midwestern neighborhood where quick hops in the family car lead to miles of wilderness hiking trails. Across from Radio City Music Hall, we bought lunch from affable vendors whose carts were snuggled up against busy street curbs. 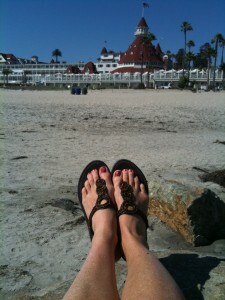 Mustard dribbled from my daughter’s steamy hot dog onto the toe of my shoe – much to her delight. We finished off our lunch at one of many coffee shops where child-sized cocoa and hand-made cannoli lured us in from an icy winter wind. Our books had lauded the cultural significance of Broadway shows but did not prepare us for the Lion King’s awe-inspiring sunset over Africa. From handy booster cushions, my daughters were captivated by elaborate animal costumes, flying silk birds, ethnic music and a particularly funny and flatulence-filled warthog. 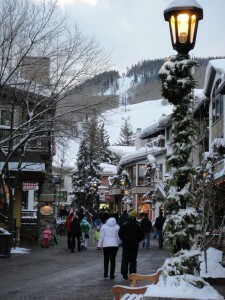 The magic continued through that night, and in the morning, the cold city had been blanketed with snow. We walked through the winter wonderland to Battery Park where a ferry embarked to Liberty Island. The snow had turned to fog, and it was easy imagine being one of millions of immigrants who had approached Ellis Island after watching the Stature of Liberty emerge from the mist. The sun came out while we explored Lady Liberty’s museum and poked our heads in the giant nostrils of her replicated face. We scaled the 354 steps to her crown for a memory we will not soon forget; in addition to the beautiful view of Manhattan and the harbor, my younger daughter lost a front tooth there. The rest of that day we spent touring Ellis Island with an audio program geared for children. The voices, easy descriptions and background sounds made the visit more interesting for me, too. It was sobering to stand where so many immigrants had entered America. Fortunately, my children were able to grasp the gravity of the place more completely after having read “The Orphan of Ellis Island,” in which Dominic Cantori travels through time to experience the island first-hand. Other historically noteworthy areas of the Big Apple are intriguing for kids. George Washington took his oath of office at Federal Hall across the street from what is now the New York Stock Exchange. A giant statue of the first president marks the spot of his inaugural address. It’s only a few blocks from there to the site of the World Trade Center where reconstruction is underway. 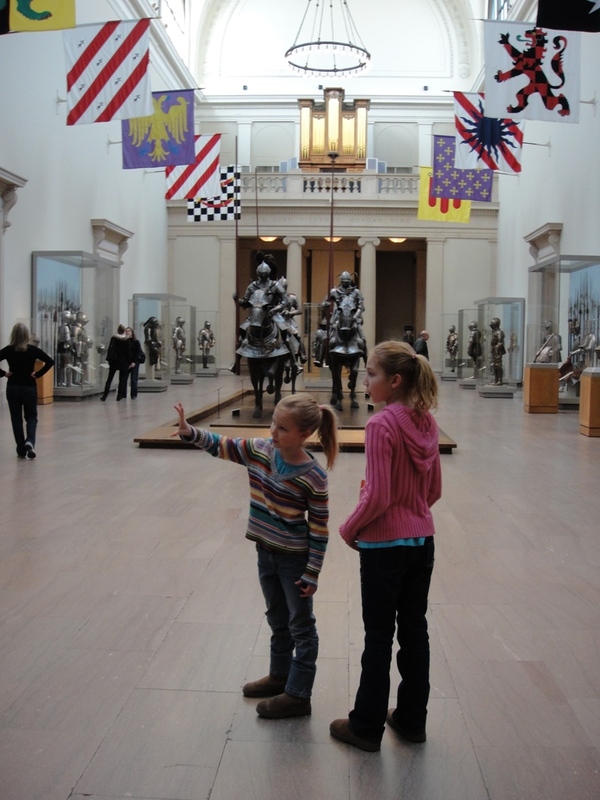 For more creatively significant activities, we walked through Central Park, past John Lennon’s “Imagine” memorial in Strawberry Fields, and into the Metropolitan Museum of Art where we found familiar pieces on every floor. We quietly honored Egyptian mummies, wondered at the colorful modern paintings and sought out the Druer drawings that my daughter had read about in “Masterpiece” by Elise Broach. I explained the beauty of the human form in the sculpture room, and we envisioned ourselves hosting guests in the carefully replicated period rooms. My daughters scampered around the Museum of Modern Art with an activity sheet that guided them through rooms of recognizable paintings by Van Gough, Matisse and Picasso. 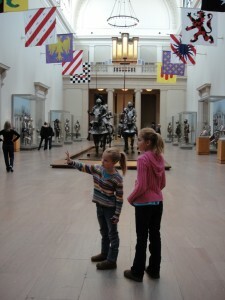 They excitedly pulled me past friendly docents to point out works of art from our books and games. A trip to the Plaza Hotel, too, was an opportunity to find familiar points of interest from “Eloise” books. The hotel’s concierge kindly guided us to their pastry shop where we delighted in cocoa piled high with real whipped cream and pastries smothered in chocolate, fruit and powdered sugar. Throughout our visit, dining remained a family adventure. In SoHo, we wandered aimlessly until we found Il Corallo Trattoria, a tiny Italian restaurant with the warm welcome of a private villa. The owner introduced me to Cannonau wine, and the staff taught my daughters to twirl pasta efficiently. What a surprise to emerge on a cold, dark New York street after dinner instead of onto a golden Sardinian countryside. During rush hour in Grand Central Station, a businessman and his partner offered us their table overlooking the main terminal so that we could enjoy our Shirley Temples and appetizers with a Grand view. In this metropolis reputed for being impersonal and brusque, we learned that the people are what make the city – and we found both to be welcoming, exciting and easy for a visiting family to enjoy. WHERE TO STAY - Times Square is centrally located and has several hotels, but to stay in the financial district of Manhattan, Andaz on Wall St. is the only option. 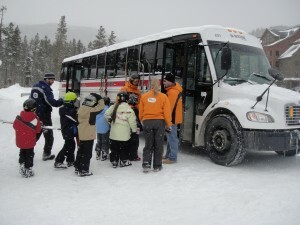 Its sleek appearance belies its capability to comfortably host children. WHERE TO EAT- Il Corallo Trattoria at 172-176 Prince Street offers cozy Italian. Try their Cannonau wine and ask about its history. The lounge in The View at the top of the Marriott hotel in Times Square rotates once per hour and has an appetizer buffet that makes a nice après-theater meal. WHERE TO SKATE- Rockafeller center is the stuff of movies, but locals suggest skating at Wollman Rink where skates rent for $8-11 and lockers cost about $4. Battery Park has a new rink that costs $10 admission and rents skates for $3. WHERE TO WARM- In close proximity to everything in the Big Apple, you’ll find a Starbucks – where a familiar-tasting kid-sized cocoa can be counted on for a smile. 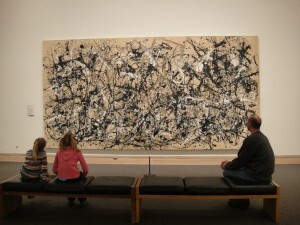 ART HUBS- Adult admission is $20 at the Museum of Modern art (www.moma.org) and at the Metropolitan Museum of art (www.metmuseum.org). Children are free. VISIT THE CROWN- Security is tight at the Statue of Liberty, and crowds are carefully regulated. Make advance reservations at www.statuecruises.com. 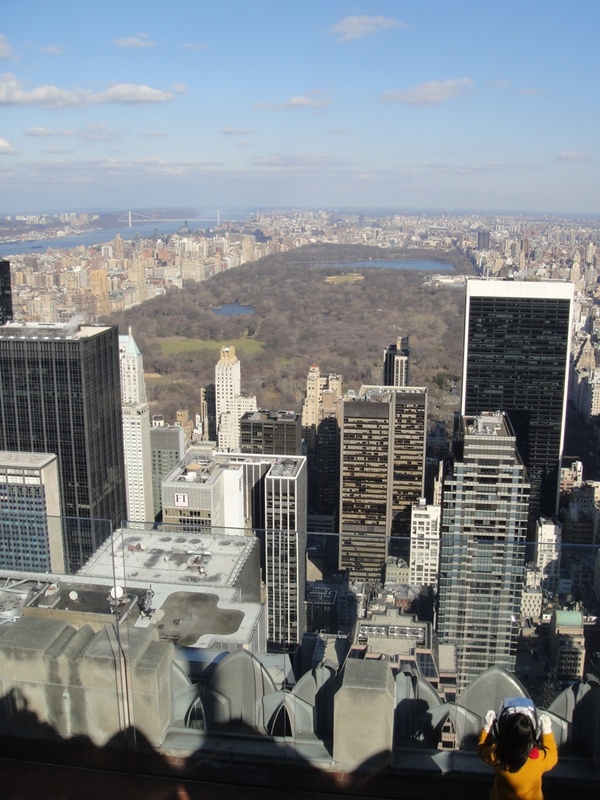 GRAB A VIEW- The unimpeded view from the top of Rockefeller Center, includes Central Park, the Empire State Building and all of the boroughs of New York City. 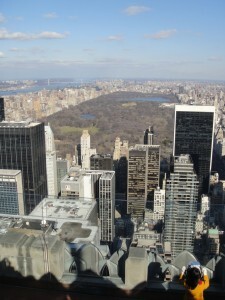 Advance tickets and information about Top of The Rock can be found at www.topoftherocknyc.com.